Depending on the number of players (2, 3, or 4), set up the basic map according to the appropriate diagram to the right. Be sure to match the planet numbers on each tile with the diagram. (Planet color doesn't matter). 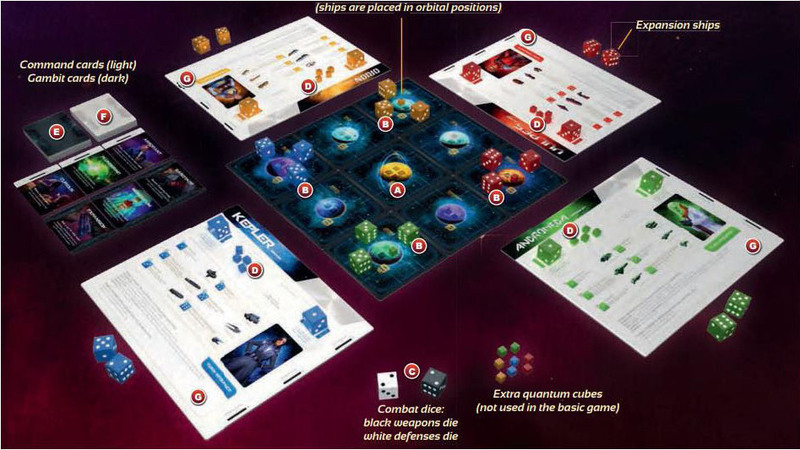 Each player chooses a command sheet, plus 7 dice and 5 quantum cubes (the small cubes) of matching color. Two of the quantum cubes are not needed (they are used with advanced maps). 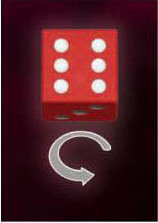 On your command sheet, place a die in the research box and a die in the dominance box, both with the «1» facing up. Place your 5 cubes in the quantum cubes box on your command sheet. Roll 3 other dice. These are your starting ships. If you don't like the results, you may re-roll all 3 of your ships only one time, but you must re-roll all 3, and you must keep the second roll. (If this is your first game don't worry about re-rolling). 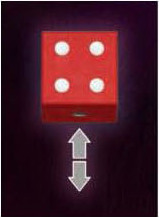 Your remaining 2 dice are your expansion ships and are placed to one side of your command sheet. The first player is the one with the lowest ship total (resolve any ties by rolling other dice). 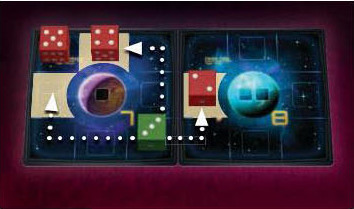 Starting with the first player and going clockwise around the table, place one of your quantum cubes on one of the starting planet locations as indicated by the red arrows on the map to the right. Then, in player order place your 3 ships in spaces next to (not diagonally adjacent to) your starting planet. The 4 spaces next to a planet are called orbital positions. Set the 2 combat dice - the black weapons die and the white defenses die - near the map. Finally, separate and shuffle the two kinds of advance cards - the darker gambit cards and the lighter command cards - into separate face-down decks. Deal 3 of each type face-up to one side of the map. The remaining cards are placed in 2 facedown decks nearby. (Don't worry about reading the face-up cards before the game starts). The goal of Quantum is to conquer the sector by placing all of your quantum cubes on the map. You can place quantum cubes in 2 ways: by constructing them on planets, and by destroying enough enemies to achieve infamy. As soon as you place your final quantum cube, you immediately win the game. Quantum cubes are impossibly huge, planetary energy extractors that provide the massive power required for quantum drive technology. They also serve as deployment outposts for your fleet: as you place them on planets, you gain a new location to deploy your ships. Once a quantum cube is placed on a planet, it cannot be removed from the map. Each of your dice on the map is one of your ships. The die number is the number of spaces a ship can move. The die number is also the combat power of your ship - with lower numbers more powerful. If the rules mention a space "next to" something - like a die - it means the 4 spaces orthogonally adjacent to the die on the grid of the map and NOT the diagonally adjacent spaces. If the rules mention "surrounding spaces", that means the spaces next to the space of the die AND diagonally adjacent spaces. Orbital positions are the four spaces next to a planet. 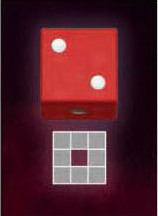 In the illustration, the red 3 die is in an orbital position around the planet, but the red 5 in the corner is not. 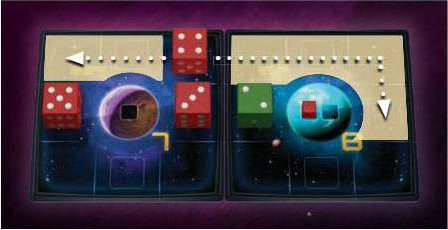 At the start of the game, you place your dice in orbital positions around your starting planet. Ccommand your fleet on the map, build quantum cubes, and research future advancements Take up to 3 actions + use ship special abilities. Reconfigure: reroll one of your ships. Deploy: move one of your ships from the scrapyard to the map. Move/attack: move (and possibly attack) with one of your ships. 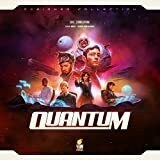 Construct: build a quantum cube (uses 2 actions). Research: add 1 to your research die. Unused actions do not carry over to future turns. You can choose the same action more than once. Each ship can move/attack only once per turn. Each ship can use a special ability once per turn. A ship's special ability never uses up one of your 3 actions. Even if the number of a ship changes, a single ship die can only move/attack once per turn, and can only use one special ability per turn. one card for a research breakthrough - if your research die reached 6.
one card for each quantum cube you placed during your turn. Then announce the end of your turn, and the next player's turn begins. Take up to 3 actions on your turn. instantly transform a ship through quantum uncertainty. the reconfigure action lets you reroll one of your ships that is on the map or in your scrapyard. Roll the die. If you get the same number, keep rolling until you get a new number. Bring a destroyed and re-outfitted ship from the scrapyard back into action. The deploy action relocates a ship that was destroyed in combat from your scrapyard to the map. Take the ship out of your scrapyard and place it in an empty orbital position next to a planet that has one of your quantum cubes. This does not count as that ship's move for the turn: you can deploy a ship and move it in the same turn (this uses two actions, of course). Your 2 expansion ships cannot be deployed. They can only enter the game when you play the expansion gambit card. Tactical ship movements and combat. The move action lets you move one of your ships on the map. Attacking is part of moving - you attack by ending your move on an enemy. Moving: A ship can move ONLY once per turn, up to the number of squares indicated by its die; however, it may change direction as often as you like. Even if its number changes, a ship die can only move once a turn. Ships can move to any square next to them (they don't move diagonally). 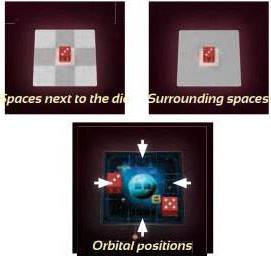 Orbital and non-orbital locations can be used for movement. Ships can neither pass through nor land on planets. Planets are not spaces for movement - they are obstacles. Ships cannot pass through other ships. You must end your move on an empty square unless you are attacking. Attacking: Attacking is part of moving - it is not a separate action. The red 4 can move to any of the highlighted spaces. Other spaces are blocked by planets and by friendly and enemy ships. To attack, end your move in the square of an enemy ship. Move your ship halfway into the square to show you are attacking. It costs a movement point to move into an enemy square. 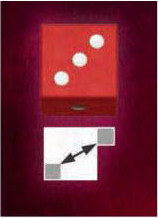 For example: a "1" die can only move 1 space total. So it can only attack a ship that is next to the space from which it started its move. Once a ship attacks, its movement for the turn is done; it cannot move after it attacks. The green 3 can use its 3 movement to attack the 4 or the 2 but the 5 is out of reach. The 3 decides to attack the 4 and is placed halfway into the 4's square. After moving to attack, the attacker rolls the black weapons die and the defender rolls the white defenses die. 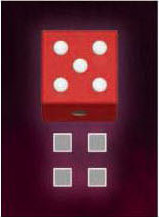 Each player adds the number they rolled to the die number of their ship involved in the attack. Compare the two totals. The lower total wins, and the attacker wins ties. The defending ship is destroyed, rerolled and placed in the owner's scrapyard (in the scrapyard, the remains of the destroyed ship are immediately transformed via quantum technology into a new ship). The attacker can choose to move into the defender's square OR move back into the square from which it attacked. The attacker gains 1 dominance and the defender loses 1 dominance, which players record using the dominance die on their command sheets. If the defender has a lower total, the attack has been repelled. The attacker is not destroyed, but simply moves back into the square from which it attacked. No dominance is gained or lost. There is no risk to the attacker should an attack be unsuccessful. The green 3 attacks the red 4. Both players roll combat dice and get 2s. The attacker has a lower total and wins the combat. The red 4 is rerolled and placed in the red player's scrapyard. The green player decides to move the 3 back into the square from which it attacked. The attacker gains 1 dominance and the defender loses 1 dominance. Harness an entire world's power by building a massive quantum energy extractor. The construct action is the primary way you build quantum cubes and win the game. You can construct a quantum cube on a planet if you have ships in orbital positions around it that add up exactly to the planet number. Example: you could construct a quantum cube on a size 8 planet with a 6+2, a 5+2+1, etc. The construct action is not affected by ships diagonally adjacent to the planet, nor by enemy ships. You must exactly match the planet number. If your ships in orbital positions add up to a higher or lower number, you cannot construct. 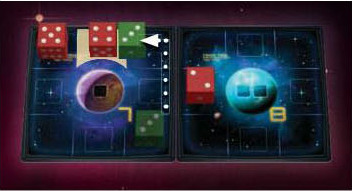 The green player can construct on this planet because the green dice in orbital positions (5 & 3) add up exactly to 8. The enemy red 3 and the green 2 in the corner do not affect the action. 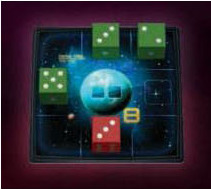 The green player uses two actions and places a quantum cube on the planet. 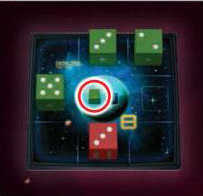 The green player cannot build another quantum cube on the same planet because there is already a green cube there. Construct uses up two of your actions on a turn. To construct, place one of your quantum cubes on an empty location on the planet. 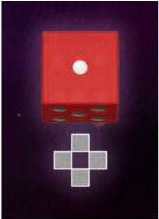 Most planets have multiple locations for placing cubes. A size 8 planet has 2 locations, a size 9 has 3, and a size 10 has 4. You can't place two of your quantum cubes on the same planet. But different players CAN build on the same planet. 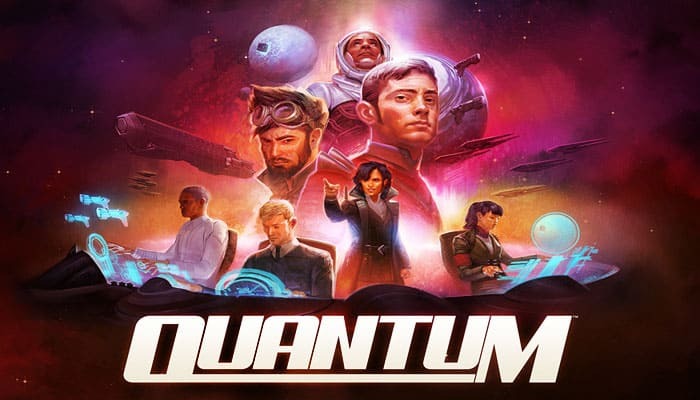 During the advance cards phase of your turn, you will select one advance card per quantum cube you placed during the turn. Invest in the advancement of knowledge and the evolution of your fleet's capabilities. The research action adds 1 to your research die. Change the research die on your command sheet so that the number increases by 1. You can use as many actions as you want for research each turn; however, you cannot increase the research die higher than 6. During the advance cards phase of your turn, if your research die has reached 6, you have achieved a research breakthrough and can select any available advance card. The research die is then reset back to 1. Ship abilities can only be used on your turn, and only by ships on the map. (Ships in the scrapyard and expansion ships can't use abilities). Strike: attack space next to the battlestation Strike gives you a single free move/attack of 1 space that must include an attack. It is possible to move/attack normally and also use strike for a second attack on the same turn. Transport: carry ship as you move Place one of your ships that is in any surrounding space on top of the flagship. Then use the flagship's move action to move the flagship 1 or 2 spaces. Finally, place the transported ship in any empty surrounding space. A flagship cannot attack if it transports, but a transported ship CAN move and attack normally after it is dropped off. Mainstay gunships of a fleet. Warp: swap places with one of your ships on the map Warp does not count as the destroyer's move. Modify: change to a 3 or 5 After you modify, you can't use the ship's new ability this turn, since modify was the ship's ability use for the turn. Maneuver: travel diagonally Activating maneuver during your move action lets you go to any surrounding space as you move. This means you can travel diagonally as part or all of your movement. You CAN attack diagonally. Free Reconfigure: re-roll the ship. If you roll a 6, roll again until you get a new number. The transport ability of the Flagship and the maneuver ability of the Interceptor are used as the ship is taking its move or move /attack action. For example, if you move a flagship and have it use transport , you have used up the ship's move for that turn and also its special ability use for that turn. So the use of these two abilities does use up an action - the ship's move action. Your dominance is a measure of your combat supremacy. When it reaches 6, you achieve infamy and can leverage your commanding reputation to place a quantum cube anywhere on the map. You can achieve infamy multiple times during a game. Every time you destroy an opponent's ship, move your dominance die up by 1. Every time one of your ships is destroyed, move your dominance die down by 1. Your die starts at 1 and cannot go above 6 or below 1. Place a quantum cube immediately when your dominance die reaches 6. Put the quantum cube in any empty cube location on a planet where you do not already have a cube of your color. You do not need to have a ship next to the planet where you are placing the quantum cube. Place the quantum cube immediately - do not wait until the end of your turn. After you have placed your quantum cube, reset your dominance die to 1. It can go up again during the same turn. During the advance cards phase of your turn, you will select one advance card per quantum cube you placed during the turn. Advance cards are powerful rewards for placing quantum cubes or achieving research breakthroughs. one card from the extracted power of each quantum cube you placed during that turn. one card if your research die reached 6 and you achieved a research breakthrough. Select any one of the 6 face-up advance cards. There are two kinds of advance cards. The dark gambit cards are one-time, bold actions. They take effect immediately and are then discarded. You cannot hold on to gambit cards. Resolve gambit cards as soon as you select them. The light command cards give you permanent abilities for commanding your fleet. They are lasting effects and are attached to one side of your command sheet for the rest of the game. You can have up to 3 active command cards. 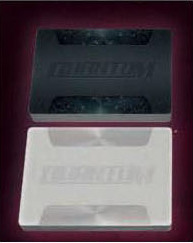 After choosing a card, immediately replace it by drawing a new one from the corresponding deck. You can have a maximum of 3 active command cards. If you already have 3 command cards and you get the opportunity to select a new card, you can still choose a gambit card or you can replace one of your command cards with a new one (discard the one that you replace). You always have the option of spending one of the card draws you've earned in order to discard the 6 cards available, and draw 6 new ones. Remember, each time you do this, you draw one card fewer that turn! Discards are placed face-up in a discard pile next to the corresponding deck. If there are no more cards in a deck, shuffle the discards and make a new deck. New command cards take effect when the next turn starts - you don't use them on the turn that you get them. Gambit cards take effect immediately. The expansion gambit card is the only way to bring your two expansion ships into the game. If you already have both of your expansion ships in the game, you cannot use EXPANSION cards. There are more card-specific clarifications and explanations in the FAQ section of these rules. You win immediately as soon as you place your final quantum cube on the map.